Utah County is inviting residents to come out, see what projects are planned for the future, and share their thoughts on transportation priorities. The gatherings will happen at several Transportation and Planning Community Fairs around the valley. 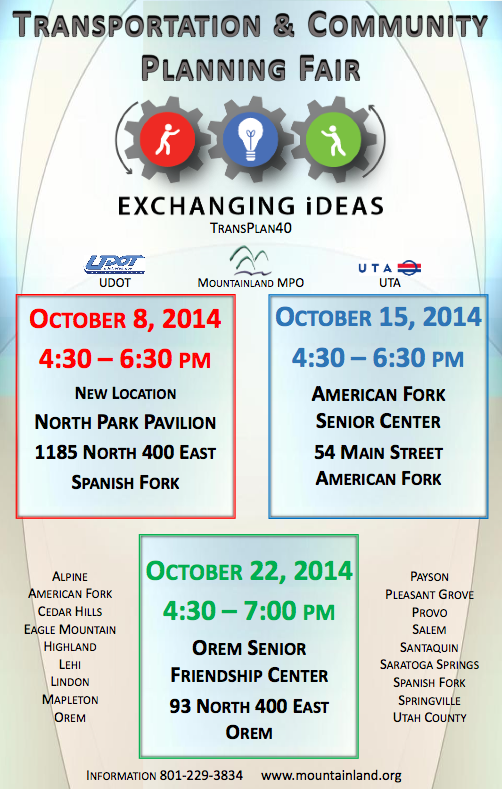 The one closest to us will be held in Orem (93 N. 400 E.) on October 22nd, from 4:30 – 7:00 p.m. Prior to the meetings, check out the Mountainland Association of Governments website to take an educational quiz on how transportation projects work and share your comments with the government. What kind of bicycle infrastructure to you want Provo to have in the next 40 years? This is your opportunity to help make your transportation hopes a reality.